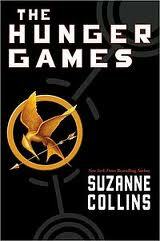 My Series Sunday pick is The Hunger Games Trilogy by Suzanne Collins. This review includes all three (3) books: The Hunger Games, Catching Fire and Mockingjay. I'm so late to this series, it is not even funny. I fought giving in to the Hunger Games craze for as long as I could. Welp, I drunk the kool-aid. And let me just say, it is worth every bit of hype. There isn't much more I can say about this series that hasn't been covered in the fitty-lem reviews already published. So I will just entertain those who live under a rock. Panem is a country that "rose up out of the ashes of a place that was once called North America." The Capitol is surrounded by twelve districts. In the Dark Days, there was an uprising against the Capitol. Twelve districts were defeated; the thirteenth district was destroyed. To prevent another uprising, the Capitol has turned cruel and harsh. The Hunger Games is an annual reminder to never repeat the Dark Days. The Hunger Games has simple rules, yet a complex hard-to-swallow concept. Each of the twelve districts must provide one boy and one girl (tributes) between the ages of 12 and 18 years old to participate. The 24 tributes are imprisoned in an arena for several weeks. The tributes fight; the last tribute standing wins. And it is all taped for family and friends at home to watch. The winner and his/her district is blessed with prizes (mostly food) for a whole year. It is basically a televised fight to the death...amongst children. Sixteen-year-old Katniss Everdeen lives with her mother and younger sister, Prim. Ever since her father was killed in a mine accident, she has become the Head of Household. Hunting for food to prevent starvation and learning survival tactics is second nature. So when her little twelve-year-old sister is picked to participate in the Hunger Games for District 12, Katniss volunteers to take her place without hesitation. At first the 74th Hunger Games are filled with flashy fiery costumes and delicacies. Then practice and training begins to prepare the 24 tributes. But one tribute in particular, who just so happens to be the main character, has everyone in the Capitol's attention. Unjust game on! Because The Hunger Games is the first book in a trilogy, it was obvious whether Katniss Everdeen would win. The interesting part was what happened in the arena and Katniss' growing relationship with the other tributes (namely Peeta—the boy tribute from her district) and entourage of stylists, chaperone and mentor Haymitch. 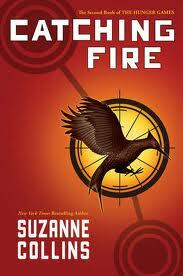 In the second installment, Catching Fire, Katniss is rich, famous and hated by the Capitol. She overthrew authority. She made a mockery of the Hunger Games. Her little trick with the berries was an act of defiance. The Capitol surely cannot let Katniss just walk away unharmed. Now life back in the district isn't so different from life in the arena. She still has to fight and face whoever wants her dead. 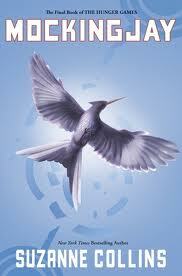 In the final installment, Mockingjay, Katniss is crowned the Mockingjay: the symbol of an uprising. It is the rebels versus the Capitol. And it is unclear whose side Peeta is on. But Gale, Katniss's best friend, is by her side. It's just unclear who Katniss will choose in the end...if she survives. Some people compare The Hunger Games Trilogy to the Twilight series. Nope. It is totally different. It is more mature. It is deeper. It is frighteningly more realistic. (Shout-out to those who believe the government already has such controlling plans for citizens.) There is no fluff or wordiness. It's impossible to skip a paragraph and not miss a vital element of the story. Through the author's words, the characters show us their feelings and personalities, rather than tell us. Almost every piece of dialogue is essential. The writing is an editor's dream! And the movie? Great adaptation! **DISCLAIMER: I do not suggest this series for children under the age of 16 years old, no matter his/her maturity level.